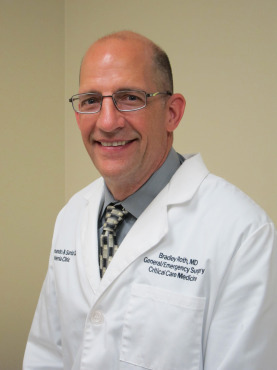 Dr. Roth has over 20 years of surgical experience. He has devoted a lot of his surgical practice to the treatment and repair of both simple and complex hernia problems. He is certified by the American Board of Surgery in General Surgery and Surgical Critical Care. He is a fellow in the American College of Surgeons. Dr. Roth is one of the few Trauma Surgeons in California who is also certified by the United Council for Neurologic Subspecialties in Neurocritical Care. San Fernando Valley and Santa Clarita areas. Providence Holy Cross Medical Center in Mission Hills, Henry Mayo Newhall Memorial Hospital in Santa Clarita and Valley Presbyterian Hospital in San Fernando Valley . Dr. Roth completed medical school at St Louis University in St. Louis, Missouri. He completed his general surgery training in Hawaii at Tripler Army Medical Center and received advanced training in Trauma and Surgical Critical Care at LAC-USC Medical Center in Los Angeles. He was a full time Assistant Clinical Professor of Surgery in the Department of Surgery, Keck School of Medicine, University of Southern California for nine years. Dr. Roth has published multiple papers and book chapters on trauma and critical care topics and has presented over 36 lectures on these topics.